Q: Will this course allow me to earn my certification? A: Yes. If you pass either of the two programs offered online, you will receive a digital and hard copy PALS provider card which acknowledges your successful completion of the exam. Q: How long does this certification stay active? A: The PALS provider cards sent to individuals who have passed either course will stay active for 2 years. The cards have an issue and expiration date as are standard on medical certificate cards. Q: What is your accreditation status? 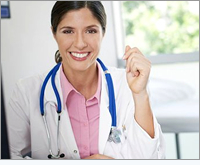 A: Our courses are endorsed by the North American Medical Certification Committee of Advisors (NAMCCA). NAMCCA was created with the purpose of setting a precident for online medical certification courses by ensuring they uphold current medical guidelines that are required through traditional offline examination. Q: Will I receive continuing education credit after passing the exam? A: Yes. You will either receive 4 CEUs for recertification or 8 CEUs for certification. CEUs are awarded by NAMCCA and follow current CEU protocol in that they be awarded based on the average hours of participation or preparation that is required to successfully pass each exam. Q: Do you offer a satisfaction guarantee? A: Yes. Please refer to our terms and conditions page for more details. Each individual receives 100% satisfaction with the acheivement and recognition they've earned through our courses. Q: How quickly will I hear from you after submitting my answer selection? A: Our staff will grade your answer selection within one business day of receiving them unless you've selected the rush review option. They will then immediately respond when complete to the email provided with your test outcome and attached PALS provider card if you've passed. If you are looking to quickly complete your PALS or ACLS certification online, our programs are the ideal choice for you. Critical Care Training provides a practical solution for you to earn your certification or recertification through our convenient 100% online courses. Our website offers affordable and comprehensive programs that are easy to understand and complete from any computer in a short duration of time. We are proud to offer PALS certification, PALS recertification, ACLS certification and ACLS recertification online programs that follow current ECC guidelines and are based on AHA and AAP published clinical recommendations. PALS & ACLS Certification Our PALS and ACLS courses are crafted according to the most recent 2010 AHA, ECC and AAP guidelines. The ACLS online recertification class incorporates material consistent with reputable instructional techniques based on initial ACLS certification guidelines. Additionally, the PALS and online ACLS classes can typically be completed in one sitting and usually in less than one hour. You can now order the new 2010 updated AHA ACLS manual or purchase the 100% online ACLS course to prepare for either ACLS test. The online ACLS course is our newest and most convenient option for health and medical practitioners who need to complete their ACLS certification or ACLS renewal with limited available time. For more info, visit our Courses or Manuals pages. What You Will Receive After successful completion of either exam, our staff will send a confirmation email with your score details followed by a second email later which contains your free digital PALS or ACLS certification card that can be saved in your records and printed while you await your hard copy to arrive in the mail. Both our digital and hard copy providers cards will display our official logo, your name and the issue and expiration date. Unlike other providers online, we have made the digital card our standard along with a hard copy. This allows you to receive your recognition instantly after our advisors have confirmed your passing score. Click the following link to view our PALS card example. Free Exam Retake Option Whether you've selected the ACLS/PALS recertification or initial certification, you are entitled to one free retake of the online program if you receive a score that is below 80%. Once our advisory staff have notified you of the unsuccessful first attempt and score, you can immediately ready the second set of answers and send upon completion. Similar to the first attempt, there is no time requirement to finalize and submit your second answer form for review. Please allow 1 business day or less for review and a response from our staff after submitting your final answer selection. No Skills Check Required You now have the opportunity to complete your ACLS or PALS requirements entirely online even if you are a first-time certification candidate. Unlike a number of online providers, our programs do not include a hidden skills check that you must finish in person before you can receive your provider card. Simply register for either of the online programs and complete entirely from your computer at the pace you choose. We now offer the official ACLS or PALS provider manuals for those who would like additional preparation before taking either exam. Both of our exams have been crafted specifically after this AHA/AAP-endorsed literature. Follows ECC & AHA Guidelines Both our ACLS and PALS online certification courses have been crafted after material which follows ECC and AHA guidelines; a requirement by most organizations for PALS and ACLS practitioners. We encourage you to prepare for our ACLS and PALS online recertification or certification exams with study material recommended by the official AHA as well as the American Academy of Pediatrics. Physicians, pediatricians, paramedics, nurses, nursing practitioners, and many other health care providers can renew their certification PALS and ACLS provider credentials with our convenient and fast renewal course. First-time applicants are encouraged to take our free pretest before enrolling in the official exam. Areas tested on include CPR, defibrillation, respiratory distress, cardiac arrest, tachycardia and other resuscitation and stabilization procedures for infants and young children. Take At Your Own Pace There is no time limit for either of our online PALS and ACLS courses. Contrary to all offline and a number of web-based medical providers, we allow users to take the exam at a pace that fits their lifestyle. You can finish the test in the comfort of your home or office and at a time that best works for you. This ideal feature enables you to avoid the inconvenience of having to attend a local class according to a set schedule. It also allows you to certify or recertify in the quickest timeframe, depending on your motivation. Secure Payment Choices We offer the most extensive variety of payment options to ensure our medical health programs can accommodate users with diverse preferences. We accept Mastercard and Visa as well as money order and cashiers check. Credit card payments are completed through our secure shopping cart. If paying by money order or cashiers check, please Contact Us to request instructions. New 2011 AHA Guidelines - Updated PALS Certification Courses We are proud to now offer updated PALS certification exams and online training course that is created after the new AHA (American Heart Association) provider manual. Many other online providers of PALS are not offering PALS training and certification that is based on current AHA guidelines. 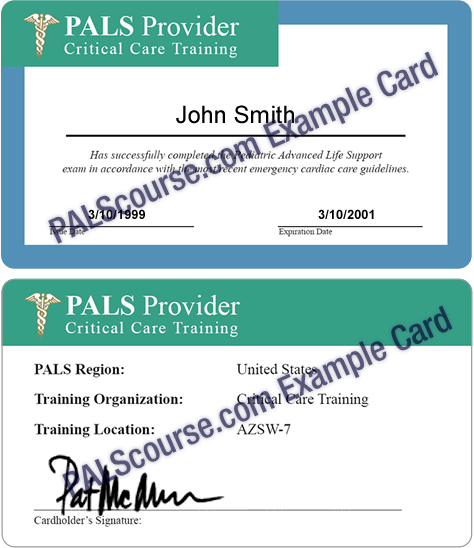 PALScourse.com is the original online provider of PALS certification and recertification classes that are designed for pediatricians, nurses, doctors and other health experts who are looking for the very best on line PALS renewal or initial certification. Get prepared online with our updated 2012 training course and earn your PALS card from our newly-revised exams today! Now Offering ACLS Certification & Recertification Classes and Training If you are a Healthcare practitioner such as a nurse or doctor and you want ACLS certification online that is crafted after the most recent AHA guidelines, our programs are the right choice. Each of our ACLS online courses have been updated after the most recent 2012 Advanced Cardiac Life Support guidelines and techniques. Get your ACLS recertification online in 1 hour or faster depending on your prior experience and keeping up-to-date with new emergency care methods. Our online ACLS certification classes have been used by hospitals, family pediatrician offices, family doctor offices and other medical facilities from around the United States so get started and earn your ACLS card now! Why Our ACLS Online Courses are the Most Convenient For Health Practitioners Our partnership with the leading online ACLS provider, National Critical Care Institute, allows us to offer the fastest ACLS training online while following rigid quality requirements of the highest level. Let's face it, nowadays doctors and nurses don't have the time in their busy schedules to obtain their ACLS recertification through standard practices of skills assessment and in-person ACLS classes. The solution is to earn your ACLS online renewal and have an email and hard copy provider card quickly and efficiently through our examination. Get quality ACLS training from our online course with rich-colored diagrahms and clean explanation that is based on the most current AHA guidelines for 2012. © Copyright /200.jpg9 PALS Course. All rights reserved.